Big government is producing high unemployment and stagnant wages. Record number in government anti-poverty programs. Fewer people to support them. Why work if the government will provide free food, subsidized housing, free health care, and a welfare check? All told, these government welfare programs cost $525 billion. Currently, there are 139 million employed people in the United States. Thus, each worker is taxed about $3,800 to support the unemployed. The average employee earns about $40,000 per year. So he gives up 9.5% of his wages to be received by the employed. The unemployment rate is 9.5%, an exact match for this income redistribution scheme. Of course, the average employed person lives much better than the average unemployed person. But this is not always true at the margin. A below average wage earner may find he or she is better off not working and choose to receive government welfare instead. This is especially true if he or she has children and would have to pay for childcare while working. The added childcare expense along with taxes and transportation expense may make it financial wiser to stay unemployed and receive government assistance. Not only are these programs costing hard-working Americans a large portion of their earnings, it is encouraging many to stay at home when they could work and would like to work. Cutbacks in such places as Oakland, Tulsa and Norton, Mass. have forced police to tell residents to file their own reports — online or in writing — for break-ins and other lesser crimes. In Tulsa, which lost 110 officers to layoffs and retirements, the 739-officer department isn’t sending cops to the scene of larceny, fraud and car theft. Tulsa police spokesman Jason Willingham says some residents have said they won’t bother to report those crimes any more. “They think nothing is going to be done, so why mess with it,” he said. In the Boston suburb of Norton, police told residents there may be delays or no response at all to some calls, including vandalism. The department posted the new policy on its website. In cities such as Oakland, Tulsa, and Norton, “there is not a force of law and public justice to protect it.” So when will anarchy and tyranny commence? Or has it already? Please post more quotes in the comments. Why can’t the US be like the US of the 1950s? Brazil is booming and brimming with business opportunities—like the “US in the 1950s”—billionaire businessman Sam Zell told CNBC Wednesday. He said if Brazil continues on the same course, he predicts that the “fiscally conservative” nation will soon be one of the top two countries in terms of growth. The real estate tycoon said Brazil has 8 percent debt, compared to 70 percent (of GDP) in the US. The country has a AAA rating from several major credit-rating institutions. Why must we look for Brazil to be the US of the 1950s? Why can’t the US be like the US of the 50s? Let’s examine some changes that have occurred to the US in the last 50-60 years. In the 1950s, government spending at all levels averaged 27.0 percent of GDP. Non-defense spending averaged 15.5 percent of GDP. Today, government spending is 43.9 percent of GDP and non-defense government spending is 37.7 percent of GDP. So government spending as a percentage of GDP has risen 62.6 percent in the last 50 years and non-defense government spending has risen 143 percent in that time. (You don’t hear these number reported to you on the news, do you?) 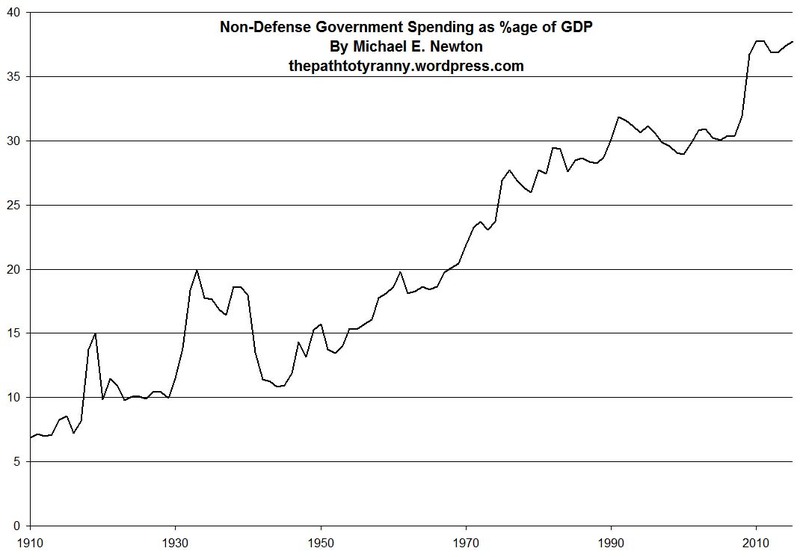 Click here to see a chart of non-defense government spending. The government now confiscates more of your money through taxes to pay for this largess. In the 1950s, government at all levels took in 26.6 percent of GDP. Now, government takes 30.4 percent of our money, a 14.3 percent increase. But that’s not all. In the last fifty years, regulation has increased dramatically. Back in 1950, there was no Department of Transportation, Federal Highway Administration, Federal Railroad Administration, National Highway Traffic Safety Administration, National Credit Union Administration, Consumer Product Safety Commission, Environmental Protection Agency, Occupational Safety and Health Administration, Federal Energy Administration, Farm Service Agency, Food and Consumer Service, Agricultural Marketing Service, Federal Grain Inspection Service, Animal and Plant Health Inspection Service, Foreign Agricultural Service, Food Safety and Inspection Service, Rural Development Administration, to name just a few. Not only do these agencies cost money, they put an added burden on consumers, businesses, and employees which costs the United States $1.5 trillion each year. That’s like an added hidden 10% tax on the economy, which would bring the real rate of taxation up to 40.4 percent. After the Great Society legislation of the 1960s, for the first time a person who was not elderly or disabled could receive a living from the American government. This could include general welfare payments, health care through Medicaid, food stamps, special payments for pregnant women and young mothers, and federal and state housing benefits. In 1968, 4.1% of families were headed by a woman on welfare; by 1980, this increased to 10%. Lastly, the United States government has actively pursued a policy of limited oil production. Back in 1950, the US produced 5.9 million barrels a day of oil and had net imports of 545 thousand barrels, 8.4 percent of the total consumptions. In 2009, US production had risen only 21.8 percent over the previous 59 years to 7.2 million barrels a day. But consumption had risen 162 percent to 16.9 million barrels. As a result, imports increased 1,680 percent to 9.7 million barrels a day. At a current price around $70 a barrel, that adds up to $248 billion a year sent overseas, about 1.6 percent of GDP. Thus, over the last 60 years, trillions of dollars have left this country, to be spent primarily by unfree societies overseas. See oil data here. A Very Popular Democrat Argues for Lower Taxes. Will the left listen? Tax reduction thus sets off a process that can bring gains for everyone, gains won by marshalling resources that would otherwise stand idle—workers without jobs and farm and factory capacity without markets. Yet many taxpayers seemed prepared to deny the nation the fruits of tax reduction because they question the financial soundness of reducing taxes when the federal budget is already in deficit. Let me make clear why, in today’s economy, fiscal prudence and responsibility call for tax reduction even if it temporarily enlarged the federal deficit—why reducing taxes is the best way open to us to increase revenues. In short, this tax program will increase our wealth far more than it increases our public debt. The actual burden of that debt–as measured in relation to our total output–will decline. To continue to increase our debt as a result of inadequate earnings is a sign of weakness. But to borrow prudently in order to invest in a tax revision that will greatly increase our earning power can be a source of strength.